A gullible mind is a weak mind and thus, it is very important to understand the importance of decision making and logical reasoning. The market is flooded with self-help books that aim to motivate the readers by providing real-life examples and eliciting behavioural theories that are difficult to follow. 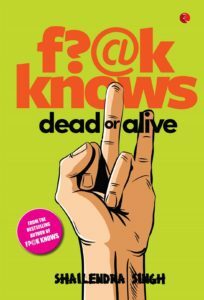 ‘[email protected] Knows- Dead or Alive’ is based on a similar concept but it uses the author’s prowess to observe people closely and analyse their mindset. A Comic banter clubbed with a resolute opinion, each chapter in this book speaks volume. Though the language is crude and is a confluence of plenty of slangs, the philosophies sound logical. Blessed with a quick mind and a marvellous gift of repartee, the author advises the readers to keep an open mind and break free from the clutches of superstitions and societal beliefs. For an example, he beautifully explains the real essence of living the moment and flowing like water. He even has a pot full of advice for the pessimists. The narration is witty, albeit, superfluous. It takes a light year for the author to reach a point (hyperbole- for those who didn’t understand). And this irked me. I could not understand the relevance of certain chapters and that might be because I haven’t read the first book. In short, I give thumbs up for the logic and at the same time, I wish that the narration was more precise! Overall, the book is not a bad choice. It’s just a play with words- different strokes for different folks!